Recently, laparoscopy-assisted total gastrectomy (LATG) has been performed for the treatment of early proximal cancer. 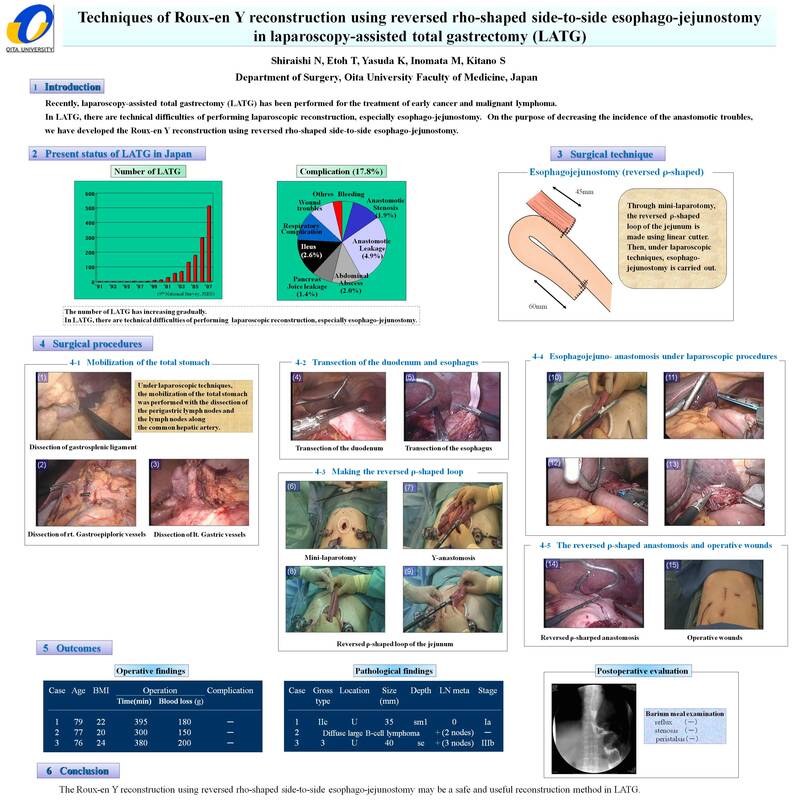 In LATG, there are technical difficulties of performing laparoscopic reconstruction, especially esophago-jejunostomy. On the purpose of decreasing the incidence of the anastomotic troubles, we have developed the Roux-en Y reconstruction using reversed rho-shaped side-to-side esophago-jejunostomy. Under laparoscopic techniques, the mobilization of the total stomach was performed with the dissection of the perigastric lymph nodes and the lymph nodes along the common hepatic artery. After transaction of the duodenum and the esophagus by a laparoscopic linear cutter (Endo-GIA), a 5-cm laparotomy was created below the xyphoid. Through the mini-laparotomy, the resected stomach was pulled out of the abdominal cavity and also the jejunum at 30cm from the Treiz ligament was pulled out and transected. After performing Y-anastomosis in Roux-en Y reconstruction was created, the reversed rho-shaped formation of the jejunum was created by Endo-GIA for esophago-jejuno anastomosis. Under re-pneumoperitoneum, the side-to-side esophago-jejunostomy was laparoscopically carried out between the right side of the esophagus and the reversed rho-shaped jejunum by Endo-GIA. We have performed successfully 3 LATGs with Roux-en Y reconstruction using reversed rho-shaped side-to-side esophago-jejunostomy after total gastrectomy for early proximal cancer. The mean operation time and blood loss was 370 min and 170 ml, respectively. There were no complications associated with the LATG. The Roux-en Y reconstruction using reversed rho-shaped side-to-side esophago-jejunostomy may be a safe and useful reconstruction method in LATG for early proximal cancer.